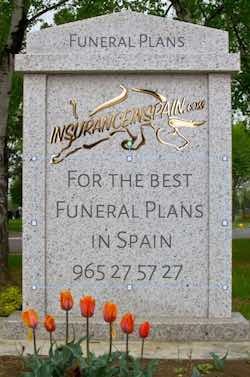 Funeral Plans and funeral planning insurance in Spain. The where, when, why and how much! ARE FUNERAL PLANS THE BEST OPTIONS IN SPAIN? Funeral Plans in Spain - a consideration. Did you know that in Spain, Portugal, Canary Islands and Cyprus where many British citizens have chosen to have a home, if someone passes away at home, the process can be quick, but complicated? Under Spanish law for example, the Guardia Civil (the Police) must be called and then a doctor is contacted. The doctor issues a temporary certificate, after which the doctor or Police will contact the local funeral director to attend to the deceased. The funeral director, who may not speak English, will ask for a “release form” to be signed without knowledge of expenses incurred, allowing the removal of the deceased. Unknowingly, your family could be charged overpriced fees, absurd extra costs, and most importantly, feel overly stressed and heartbroken that you have passed. At www.insuranceinspain.com we would like everybody to pre-plan their funeral arrangements with us, and then enjoy the rest of their lives (without worry). Another option is to have a life insurance policy that provides you with sufficient funds to cover for any funeral considerations and in the event of the death of the insured person, additional funds for his/her beneficiaries. Please click here https://www.insuranceinspain.com/life-insurance.html for more details. • Out of country funerals put a time pressure on your family and friends to pay their respects, not to mention language barriers and gaining knowledge of a very different funeral system. Keep it simple, you know it can make sense to purchase a funeral plan in Spain. It is an excellent way to ensure that your Spouse and family have peace of mind should the worst happen. If you don't want to Pre-Pay for a funeral plan in Spain then talk to us as there are other options such as Life insurances that will pay out immediately, so that your relatives will have the money to pay for your funeral costs in Spain with a little extra left over. Our choice for Funeral plans in Spain. The funeral plans above are from the market leaders in Spain with many years of experience in organising pre-paid funerals. They are operating in Spain autonomously with the UK regulated trust funds, providing security and peace of mind to clients who reside in the country. With escalating funeral costs in Spain and the significant differences that exist between a funeral in Spain, compared to a funeral in the UK, having a pre paid Funeral Plan in Spain to organise your funeral is a sensible decision. Most funerals in Spain take place within 24 to 48 hours (of a person’s death) and because of the different laws it can sometimes be difficult to release funds from your departed loved one because of their assets beings temporarily frozen. There is also the language barrier to contend with and the additional complexities of the Spanish funeral system to navigate through. You can leave all these problems to us. By organising a pre-paid funeral through www.insuranceinspain.com you can rest assured that the funeral plan you contract will make all the necessary arrangements and deal with the Spanish authorities on your behalf. A home visit service is available where they can meet you in the comfort of your own home, guide you through the variety of pre-paid funeral plans that are available and give you the time to determine what would be best for you and your family. All funeral plans in Spain are very similar in the fact that they offer base plans that sort out the legal and minimum requirements to get you buried or cremated in Spain. Like all funeral plans, they tend to be pre-paid funeral Plans so you do have to pay up front. Some offer payments in instalements - but if you die before the instalments are paid, your remaining relatives will have to cough up the balance of your funeral plan in Spain before they sort out your funeral. Something that people are missing out on when it comes to funeral planning in Spain. It is extremely easy to sort out your own funeral if you know what you want and where you want to be buried or cremated. If you are a long term resident of Spain and want to be cremated here, then it is a simple case of going to the crematorium in Spain and talking to the funeral director. Most do speak English and theyare very helpful. (After all- they are getting your business). Save money on your Funeral Plan costs. OK, so you want to keep the costs down on your funeral . By talking and making the arrangements with the funeral home in your local area, the funeral director will or may provide you with a funeral cost quotation and fix it for a period of say 5 years - depends on what, when and where, and what you are asking for. They will allow you to Pre-Pay your funeral plan so that your relatives can rest easy knowing that your funeral in spain is all taken care of. All they will have to do is to call the Funeral home or crematorium and they will make all the arrangements. After all-it's what all the ' Funeral Plan providers' will do. The base level plan which could be completed in 24 hours. • A basic cremation funeral covering the essential items pertaining to the removal and disposal of the member, suitable for single people with no family. A funeral similar in content to that which you would expect in the UK, allowing four days for family participation especially if based in a different country. This is suitable for couples and families. This is the most popular choice for our members. '1' and '2' are allowances based on current UK rates. Should the destination be in a different country other charges may apply. For further information please contact our customer services team. Questions about Spanish Funeral Plans. If you have any further questions or would like more details, please do not hesitate to call www.insuranceinspain.com on 0034 965 27 57 27. We want the best for you and can provide you with any information regarding these funeral plans in Spain. There is no obligation to buy and we are happy just to chat to you, provide you with relevent information and to ensure that you have the correct cover for your budget.